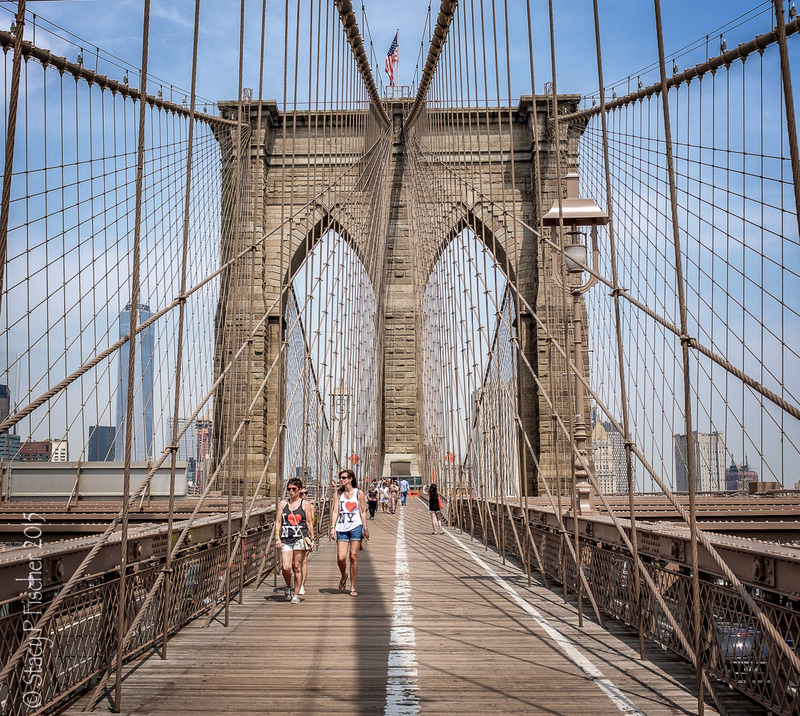 (14 photos) I think most people walk across the Brooklyn Bridge in about an hour. Me? It took over three. Despite the mid-afternoon sun, it was a photographer’s paradise! Take a walk with me as I show you what I saw as I meandered the 1.3-mile route. All photos from the Fuji X100T. 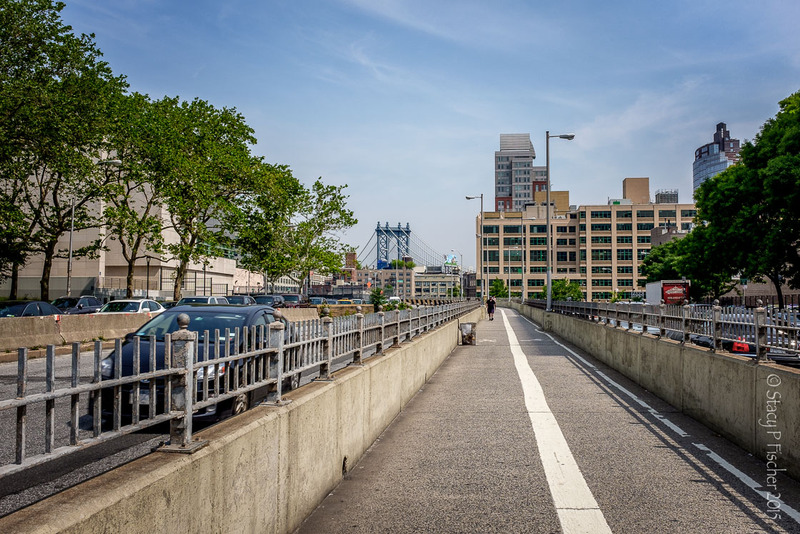 I began my walk from Brooklyn, and I have to admit, despite directions from very helpful passersby, it took me 20 minutes to find the entrance to the pedestrian walkway. Warning: it’s not very well marked. But as I finally began my trek, seeing the east span of the Manhattan Bridge in the distance was a great beginning. The approach is far from pretty, but with my focus on the east span ahead, I hardly noticed. 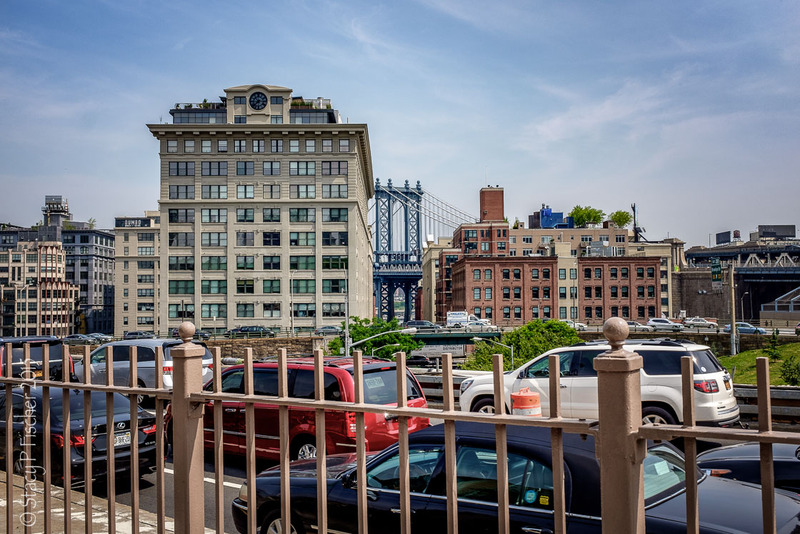 And then I spied the iconic through-the-buildings shot of the Manhattan Bridge! 10 minutes more and wow! 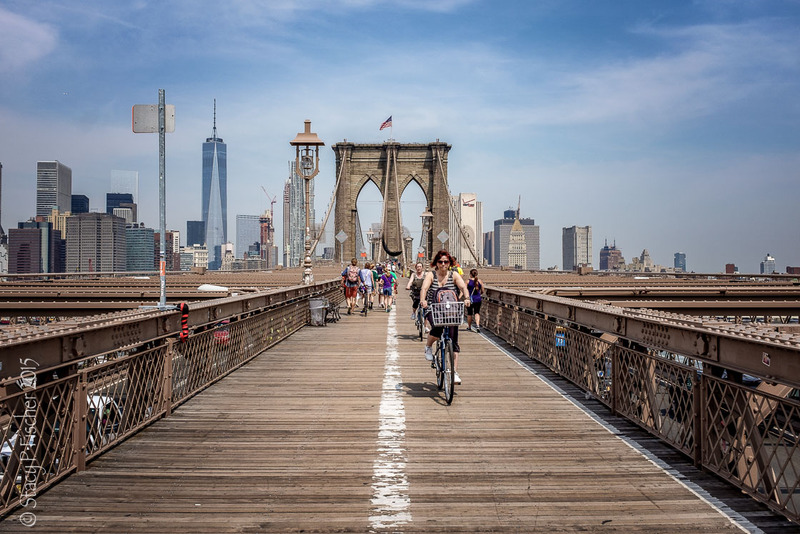 There is a dedicated bicycle lane on the bridge, but it’s difficult to fully pay attention when your mouth is hanging down to your feet and all you can do is stare at the scene unfolding in front of you. I was fortunate that the walkway wasn’t crowded, but there were just enough pedestrians to make the walk interesting. Of course, all who cross the bridge aim to get this shot of one of the spans. It took some waiting, but it was worth it! I also waited to get this shot with the sun star. And there are plenty of opportunities to take photos of others taking photos! The view looking back toward Brooklyn. 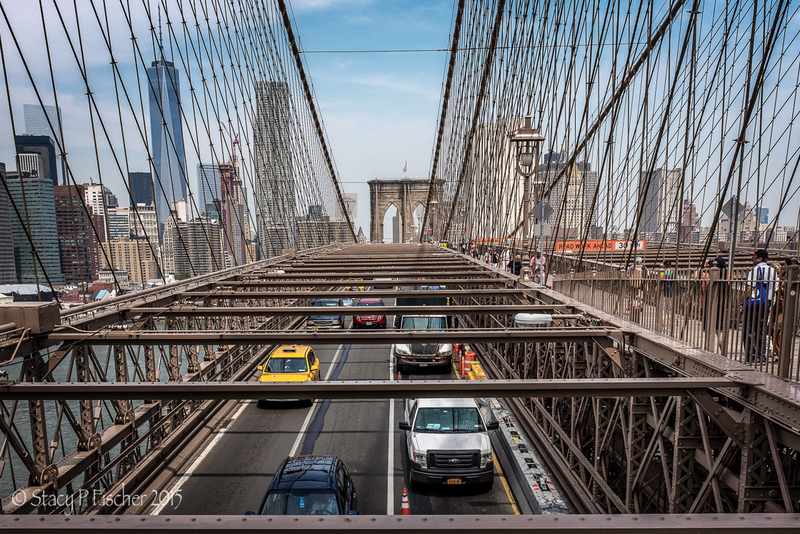 A jog in the walkway presents a wonderful photographic vantage point to shoot the traffic on the bridge. My aim was to capture a NYC taxi at just the right moment in the frame. This wasn’t exactly the frame I wanted, but it was close and there were others waiting to take my place, so on I went. 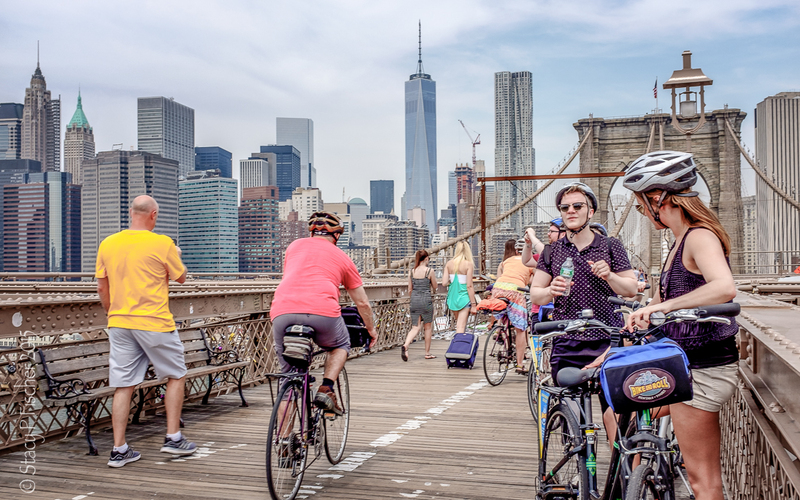 Guided bicycle crossings of the bridge are popular among tourists. 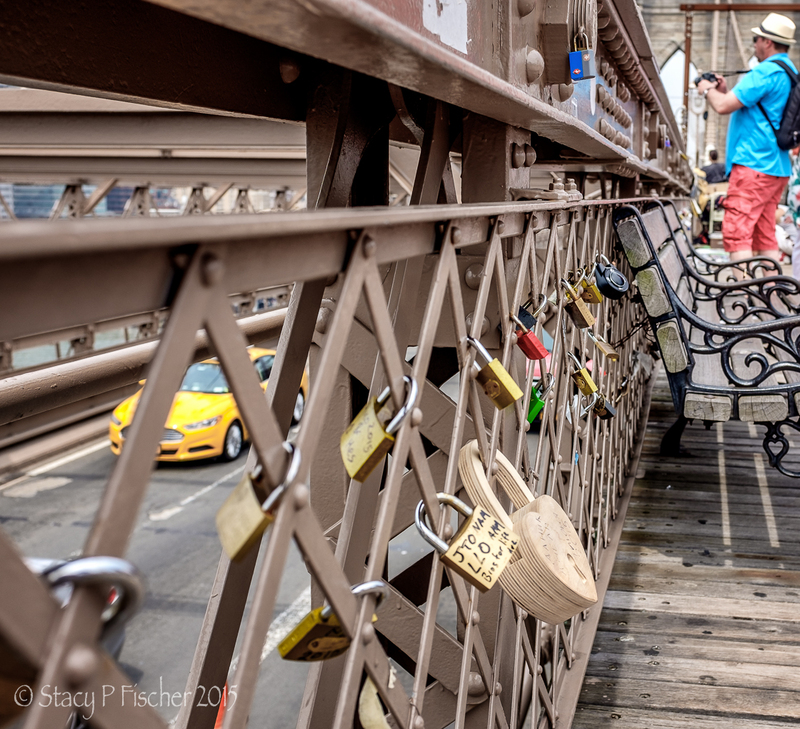 And much to my surprise, the bridge sports “love locks.” If I had known about these locks, I would have brought one to leave with a simple, but well-known, message: I ❤️NY! Next on my bucket list: Crossing it at night! 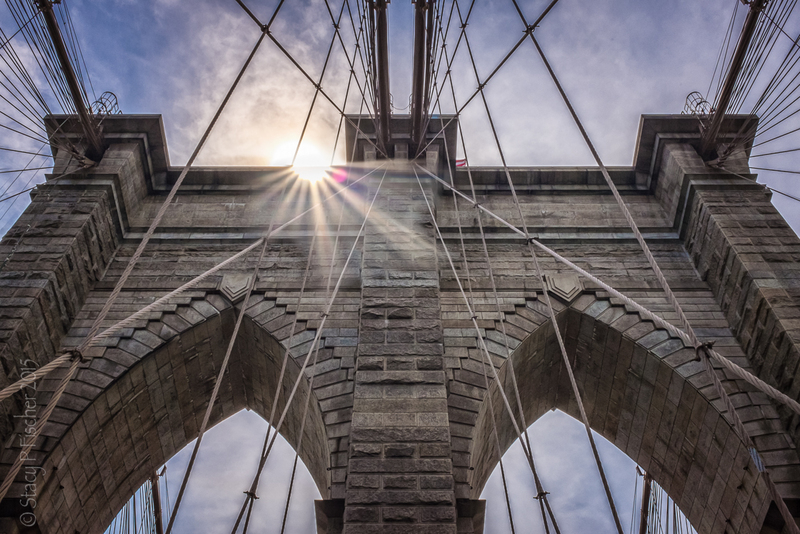 This entry was posted in Architecture, Cityscapes, New York City, Places, Street Photography and tagged architecture, bridge, Brooklyn Bridge, Fuji X100T, New York City, photography, postaday, street photography. Bookmark the permalink. There is just something about a bridge that fills me with excitement (have you been to Pittsburgh? More bridges than all other cities in the world but one). Anyway, this is a wonderful photo essay and I’m so glad you shared the “approach” shots. The last time I was in Pittsburgh was over a decade ago, long before I had a true appreciation or interest in the art of photography. I had no idea about the bridge fact, though. I do love shooting them, so now I’ll definitely have to go back 🙂 Thanks, Laurie! 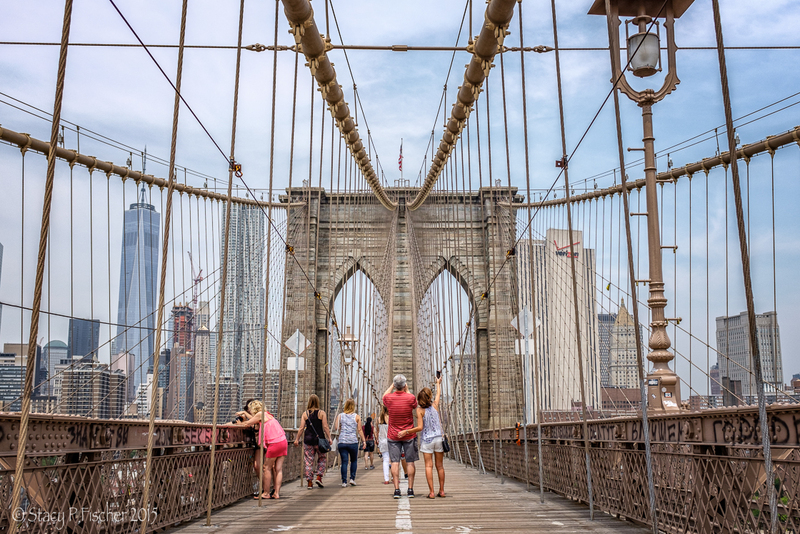 Wonderful walk over Brooklyn Bridge, Stacy. The number of times I have been to the city and yet I have never thought about walking over it. Great photos which bring the whole scene alive. I look forward to seeing your night-time shots. Absolutely, Stacy. I think I’ve done all the main attractions now, so this one is at the top of my list (with another visit to Radio City). 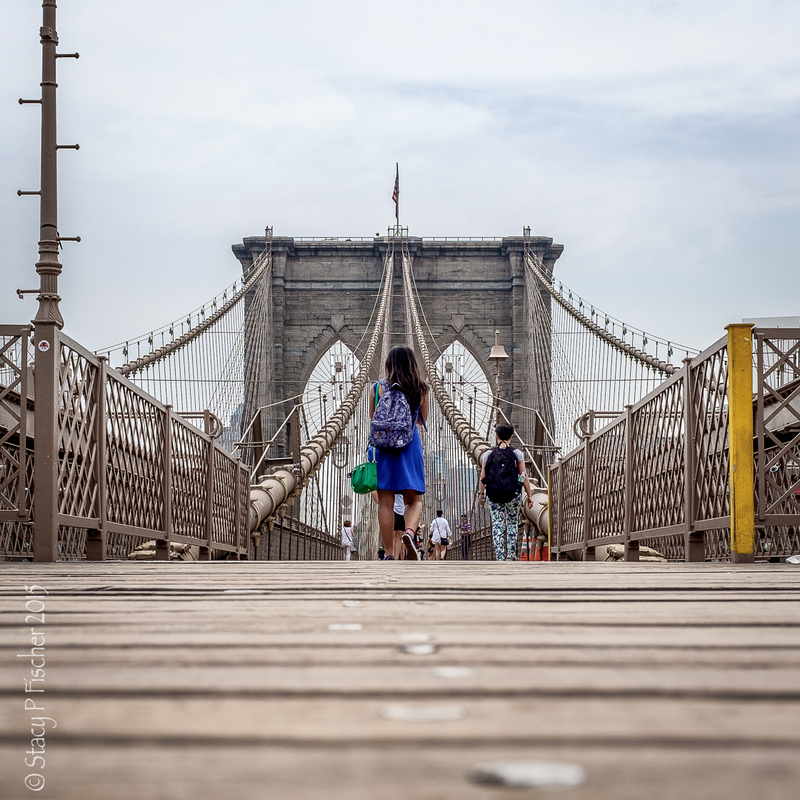 Great story Stacy, thanks for the walk – the span of the bridge and angle make for great shots. Great post, Stacy. I really liked your images. I also recall the entrance as being hard to find, but I din’t take the approach you did. 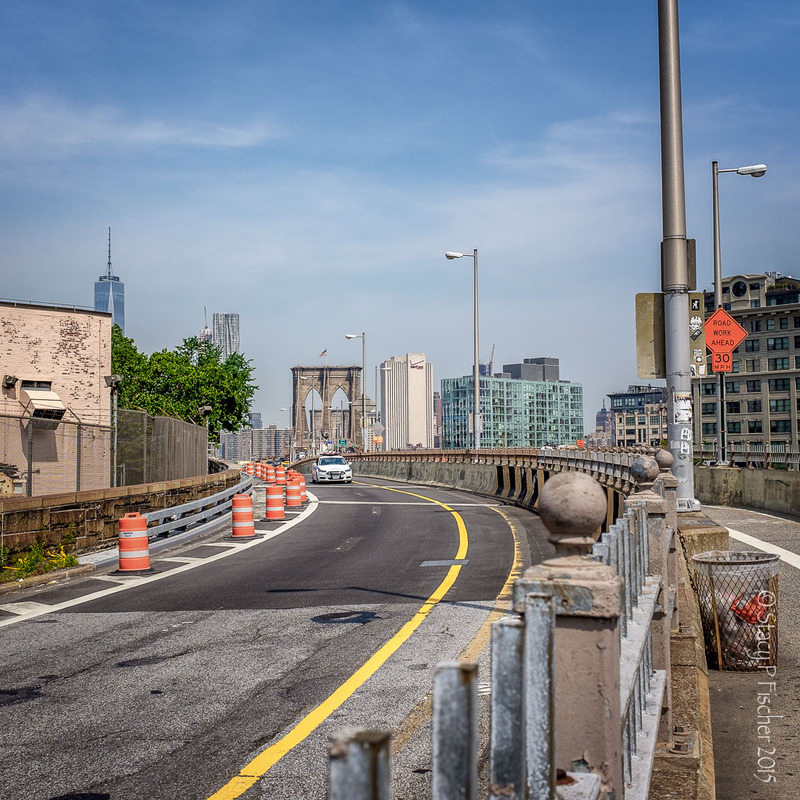 It was a hidden stairwell underneath the Brooklyn side of the bridge. Hopefully I can find it again next month when I head back up there. Thanks, Kaz! And, well, you just HAVE to come back! And seems you’re not alone in liking the one from down low 🙂 This was one I waited for, camera on the bridge, remote in my hand, poised for some unsuspecting passerby to do exactly as this young woman did (and that her outfit/accessories were so colorful was just awesome!!). Thanks, Kirsten 😀 It’s a must for everyone’s bucket list! I love the story here, especially the approach shots, where you pick out the bridge in the distance. I could feel your suspense and excitement! Thanks. I can’t wait to do this myself, I know it is on my list when I come Stacy, maybe we can do the night one together. I love the way you have done this post too. I would love that! I’m still working on my travel plans, but I’ll let you know as soon as things are firmed up (which depends on my husband’s plans). I did get to return this week on a quick overnight trip, but managed to work in a sunrise walk from Manhattan to Brooklyn. That was a quicker walk because I wanted to get over to Brooklyn to shoot the skyline from the waterfront. It was wonderful! I’m glad you liked the post – it was fun putting it together as a timeline 🙂 Thanks, Leanne! 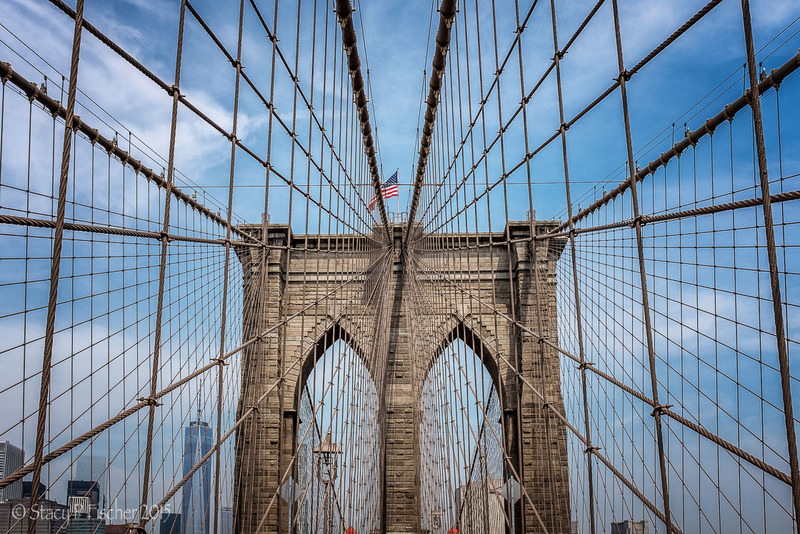 Wow bridge-sister, these are truly fabulous shots. The one from down low and the two with a single person coming towards you are all especially fabulous. I can only imagine how great it would be at night! So glad you liked the shots, Desley 🙂 The “down low” one was fun. I set my camera on the bridge, connected my remote, and waited for a good moment. Patience is a virtue and was well rewarded 😀 Thanks! Fabulous. I must start utilizing my remote more often. What a wonderful walk ! My favourite is the really low perspective one. But they’re all great. 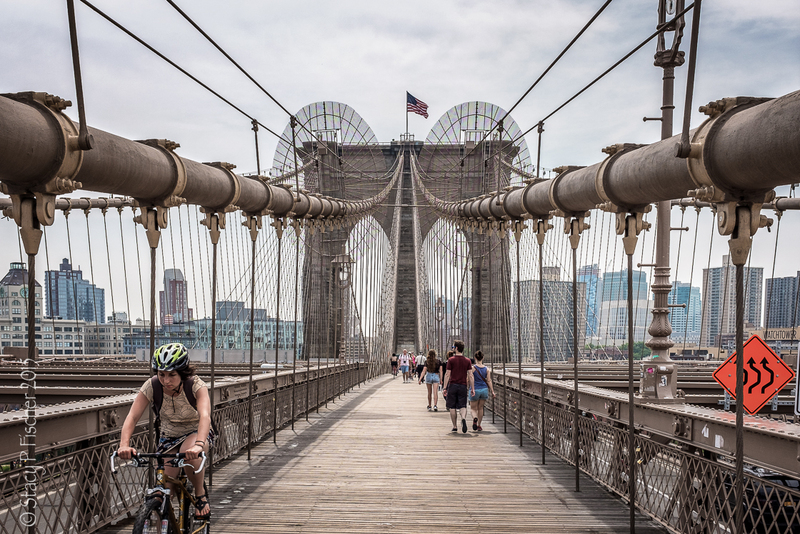 And I love the Brooklyn Bridge. I have to pay more attention next time. That’s one of my favorites too 😀 I do hope you get a chance to return and revisit this amazing bridge. I returned to NYC this week for just about 24 hours and managed to work in a sunrise crossing. So worth the effort (and even less crowded at 5:45 in the morning 😜)! Gosh you’re good at the early mornings! Stunning photos. I know what you mean about an hour walk taking 3 hours. I have to set my alarm on my phone if I am limited in time otherwise I lose track. Ha! Great solution, Raewyn 😀 And thanks very much! Thanks you, Fernan. I appreciate your kind comment! Oh Stacy I can tell you had a lot of fun. I did that once (many years ago) on the Golden Gate Bridge in San Fran. It was a gorgeous sunny day. I only had a kodak 110mm film camera (yes it was that long ago. I had a blast. Oh, Cee, I don’t know why I didn’t think about being able to do this on my absolute favorite bridge! Thanks for making me realize I could do this – I actually have the opportunity to go back to San Francisco in the fall and now I definitely know at least one trek I’m going to add to my schedule 😀 Thanks for that! A great trek Stacy, I love how you managed to carve out fabulous scenes in, and out, of the crowds. I have to say though I find the approach sort of pretty . . . . Can’t wait to see your night shots! That’s what taking three hours did, Patti 😉 As for the “prettiness” of the approach, I defer to a NYC dweller 🙂 Missed the night shots this last go round, but did get some sunrise shots of the skyline from the bridge! So glad to hear I’ve added to your bucket list, Joanne! It’s a winner 😀 And thanks! Stunning shots of the magnificent bridge, Stacy. Emily Warren Roebling stepped in the project when her husband got ill as the “first woman field engineer” and was the first to cross the bridge. 🙂 Love this bridge! LOL! Jet, that was my “eureka” photo 😀 When I spied them coming towards me, I couldn’t believe my luck and just snapped away! Thanks for especially liking this one! Awesome. That would be a photographers paradise. Don’t you wish you could close it off and shoot to your hearts content? 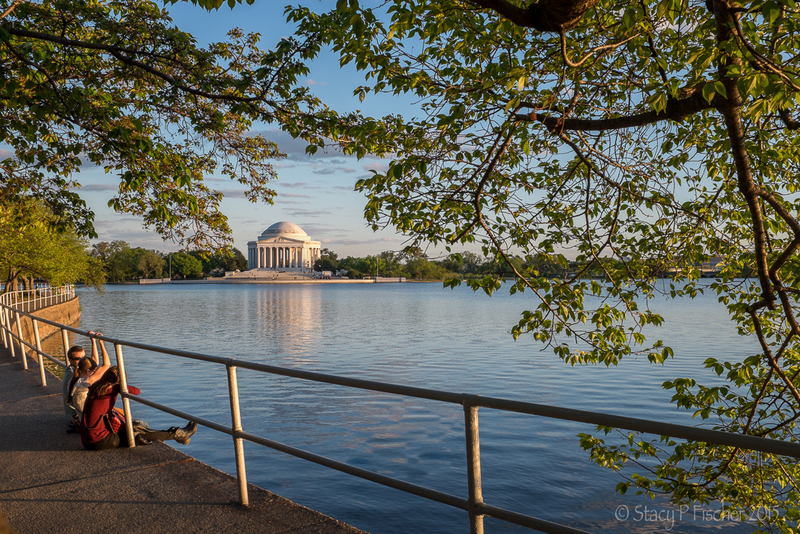 Thanks for the photo tour – and the images are spectacular. This is something I want to do some time when I am in NYC. I think my kids would enjoy it too. It’s good to know that the pedestrian access point is tricky to identify. I will have to do my research on that before we go. Nah, I’m sure I would miss it too. Signage can be obscure and elusive here I’ve noticed. Your pictures are beautiful! Thanks for sharing. Thanks so much for your kind words, Gerard! I agree that the approach is far from pretty, but definitely worth the walk! Amazing shots. That low angle one is excellent and the shots of the spans are beautiful too. Thanks, Max. If you’re ever in NYC, I highly recommend the walk!